Double Sided Tape- Campbell International Specialist Tapes. Size: 50.8mm x 54.8m Technical Specification: 3M 583 bonding film is a flexible, 100% solids, heat or solvent activated dry film adhesive composed of synthetic elastomer, thermoplastic and thermosetting resins. The film softens and flows when either heat or solvents are applied and provide.. Size: 25mm x 50m 3M™ High Performance Double Coated Tape 9087 is a 10.2 mil double coated tape with Adhesive 375, PVC carrier 1.5 mils, tape is white in color on a white paper liner with green 3M logo 10.2 mil thick double coated tape with a PVC, polyvinyl chloride car.. Designed for the Automotive Industry this double sided foam tape is manufactured on a high density PE Foam and is coated with a high shear acrylic adhesive. This tape is designed to bond automotive trim, badge mounting and the point of sale industry Sizes: 12mm x 0.5mm x 66m - Box of 25 .. This tape is simply the best double sided cloth tape available to carpet installers and exhibition and trade show contractors. It has excellent adhesion to rough, irregular or smooth surfaces. The differential adhesive provides a secure bond to carpets and tiles but allows a residue-free removal. Th..
Our Double Sided Foam Pads are perfect for holding and bonding vertical objects within the packaging and display industry. Sizes: 12mm x 12mm x 1mm - 2000/Roll - Box of 15 12mm x 12mm x 2mm - 2000/Roll - Box of 24 25mm x 12mm x 1mm - 2000/Roll - Box of 10 25mm x 12mm x 2mm - 200.. This flat paper tape was specifically designed for the golf grip industry and as such remains the number one choice for golf club manufacturers and pro’s alike. Industry recognised that the unique bonding power to steel and rubber had benefits outside the golf industry and this tape has become a va..
AT308 Advance double-sided rayon cloth tape	- One of the strongest double-sided cloth tape available. - Good low-temperature resistance. 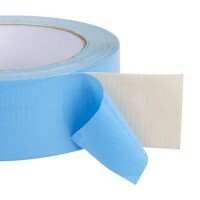 - Widest temperature range of double sided cloth tape. Technical Specification	Thickness - 0.25mmLength - 25m	Breaking Load - 80 N/cm	Elongation - 10%	Faced Side .. Please Contact us for prices, or add this product to your basket and we will contact you to complete the order. A strong, heavy-duty transfer tape with a high tack adhesive, it is perfect for the plastic and rubber industry and is also used extensively in the textile industry. The thicker adh.. Please Contact us for prices, or add this product to your basket and we will contact you to complete the order. A general purpose transfer tape ideal for paper and card bonding. Typically used in print finishing on coated paper and board, attachment of material swatches and foam insulation ma.. This remains the perfect all rounder in terms of its performance across many applications and markets. Available in a range of thickness, width and colour this foam tape has a high bond strength. The tape is perfect for bonding plastic profiles within the glazing industry. Sizes: 12mm x ..
Campbell International Extreme High Tack ‘big brother’ to the hight tack and the ultra high tack version, this tape has it all, a thick tissue carrier, very high coat weight of adhesive that delivers a very high shear and ultra high tack. Ideal for splicing and high performance bondin.. Please Contact us for prices, or add this product to your basket and we will contact you to complete the order. This high strength flame retardant/fire proof adhesive bonds well to all surfaces yet it is repositionable and offers clean removal. Originally designed for the Aerospace industry w..
Campbell International's perfect, all-purpose double sided cloth tape is the ideal carpet tape, or indeed bonding any uneven surface where you need a tape to stick! The high grab adhesive is ideal for bonding construction materials such as polythene and corex sheeting. Sizes:	6mm&n..
Campbell International high tack double sided filmic tape is a high tack clear filmic tape that is the ideal tape for bonding flat profile products. This clear filmic tape is a good all-round filmic tape that has excellent UV resistance and temperature resistance. Sizes: 6mm x 50m - Box of 192	12..
A high tack tissue (paper) tape that withstands high temperatures, is uv resistant and is hand tearable. This is the genuine ‘all rounder’ that delivers top performance at a competitive price. Solvent Acrylic Adhesive. Sizes: 6mm x 50m - Box of 192	12mm x 50m - Box of 96	25mm x 50m - Box of 48	38..
Campbell International MEGA BOND Tape that has no rival, a thick extreme grab adhesive coated on the uniform scrim that enables a clean hand tear. This tape is a powerful bonding tape that bonds virtually everything and anything. When you need the ultimate bond, trust this tape, it won’t let you ..
Strong adhesive with excellent dimensional tolerances make it the perfect solution for applications such as indoor mirror mounting. Sizes:	19mm x 0.8mm x 50m - Box of 15	25mm x 0.8mm x 50m - Box of 12	50mm x 0.8mm x 50m - Box of 6	19mm x 1.5mm x 50m - Box of 15	25mm x 1.5mm x 50m - Box of 1..
Campbell International's white filmic tape has a differential adhesive and is designed for exhibition halls where contractors must use NEC approved tape. The tape is highly visible and has the NEC print on the film. Sizes:	25mm x 50mtr - Box of 48	38mm x 50mtr - Box of 3.. Please Note: This is a contact to order product, simply call our sales team on +44 (0)1732 773364 to check current prices and place an order. All Tapes can be dispatched within 7 days. Campbell's perm/peel tape allows you to bond a permanent surface and allow the reverse side to be peelabl.. Please Contact us for prices, or add this product to your basket and we will contact you to complete the order. We developed this low tack transfer where a repositionable acrylic transfer tape is required. This very thin transfer adhesive is perfect for the print finishing and contract packin..
Campbell International's reverse wound transfer tape is produced on plastic cores to be used in conjunction with hand dispensers. This tape is 50 micron thick. 6mm x 33mtr - Box of 120	9mm x 33mtr - Box of 96	12mm x 33mtr- Box of 72	19mm x 33mtr- Box of 48	.. This medium density foam is coated both sides with a modified acrylic adhesive which conforms to the highest BS Standards for security glazing within the window industry. Sizes:	12mm x 2mm x 40m - Box of 25	12mm x 3mm x 25m - Box of 25	12mm x 4mm x 20m - Box of 25	12mm x 5mm x 15m - Box of 2..
Campbell International's translucent acrylic bonding tape is the product to choose when you require a permanent long-term bond for metal, glass, and rigid materials. The acrylic bonding tape is ideal for invisible bonding and the standard for the sign industry. This tape is 1mm thick. .Sizes:..
Campbell International's high tack, double-sided polyester tape is a transparent, filmic tape, which was designed for bonding of ABS plastic parts in the automotive industry, but has now been recognised as the tape to use for mounting rubber and EPDM profiles and touch screens in the electroni..
Campbell International's double-sided PVC tape, with the instant high tack and immediate adhesion, is designed for long-term applications. The industry standard tape for the plastic trim market is also perfect for decorative POS materials, displays, and mounting signs. Sizes: 6mm x 50m..
Campbell International ultra high tack double sided tissue tape is slightly more robust in terms of thickness and adhesive strength than the high tack double sided tissue tape, this tape has become the industry standard for the Foam and Print lamination industry. This tape is perfect for uneven o.. Combining a quality crosslink foam and solvent acrylic adhesive this range of foams have excellent resistance to UV light. These foams are ideal for window displays, outdoor signs and demanding assembly applications. Sizes: 12mm x 0.8mm x 66m - Box of 15 25mm x 0.8mm x 66m - Box of 12..